Pain in the teeth can affect everything—including the way you eat, interact with others and even smile. Although tooth pain after eating can be the sign of tooth injury or decay, it may also signal a temporary condition that can be remedied from home. 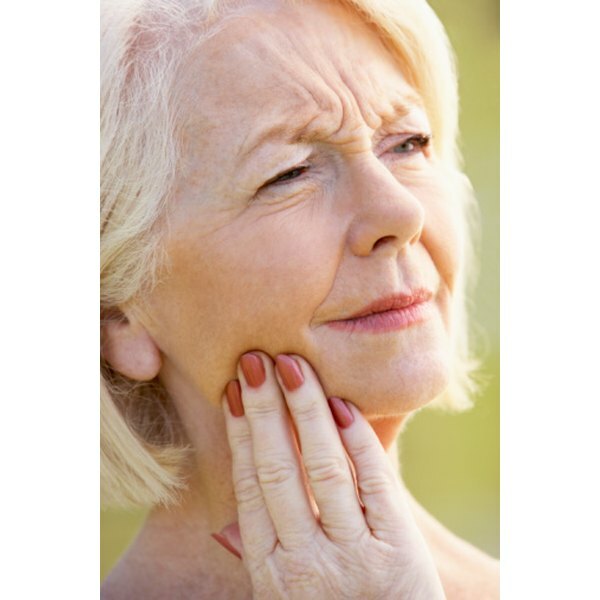 Therefore, it is important to understand what causes tooth pain and how it can be treated. “The Doctors Book of Home Remedies” notes that pain in the tooth can occur after eating, drinking, smiling, frowning, clenching the jaw or moving the head in different directions. Sometimes breathing can even cause tooth pain as warm or cold air moves into the mouth over a sensitive tooth. In addition, tooth pain can also be accompanied by redness, gum and facial swelling and peeling inside of the mouth. According to the Mayo Clinic, tooth decay is typically the cause of tooth pain. This decay occurs when bacteria clings to the plaque on the teeth and begins to create a hole called a cavity. Left untreated, this cavity can grow deeper and deeper, eventually exposing the nerve of the tooth. In addition to decay, tooth pain after eating can also be the sign of an infection or even just a little bit of food caught in between two of the teeth. Rinse the mouth and teeth out with warm water and floss to loosen any pieces of food trapped between the teeth. In addition, antiseptics such as eugenol or benzocaine can be dabbed directly onto the tooth to help reduce irritation and pain. Orally, traditional pain reliever medications, such as ibuprofen, can relieve aches and swelling. In the case of a cavity, a dentist must be seen to remove the decayed sections of tooth and replace them with a filling. To prevent tooth pain and decay, KidsHealth recommends brushing the teeth with a toothpaste containing fluoride at least two times a day—but preferably after every meal. Make sure you brush the gums as well as the teeth. To remove food and plaque, floss every night at bed time. Stay away from sugary foods and drinks, which can encourage cavities and decay. Go to the dentist two times a year for cleanings and regular checkups. Before your dentist appointment, “The Doctors Book of Home Remedies” suggests avoiding the painful tooth while eating. Food can become trapped in cavities or further irritate sore teeth and gums. Consider sucking on an ice cube or applying an ice pack to the cheek in 15-minute increments approximately four times a day. Because cold air can increase the sensation of tooth pain, consider keeping your mouth closed as much as possible.